Why Do Minnesota Vikings Fans Chant Skol? The Minnesota Vikings' relatively new "skol chant" gained new prominence after the "Minneapolis Miracle" in the second round of the NFL playoffs. 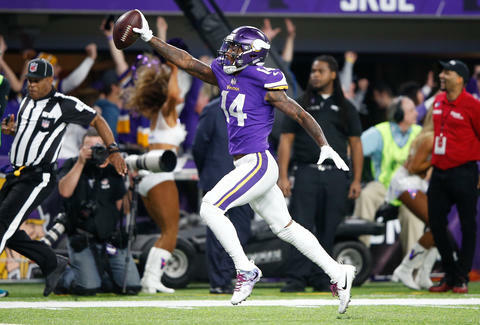 With just 10 seconds left and elimination a foregone conclusion, quarterback and freeze tag-enthusiast Case Keenum hit receiver Stefon Diggs for an improbable 61-yard touchdown. It was the first-ever fourth quarter walk-off touchdown win in an NFL playoff game. Where Does the Vikings' Skol Chant Come From? The chant came to the Vikings from the Icelandic men's soccer team. After the team upset England at the Euro 2016, the national team arrived home to thousands of fans doing the "Viking War Chant." In the chant, fans raise their arms in the shape of a "V" while a drummer plays two quick beats. Fans follow with a single clap and, in the Vikings version, yell "Skol." The scene inspired Vikings fans who began emailing the team. It had Viking in the name and fans thought their Vikings should adopt it. “It was super-intimidating, showing people together in unison. Immediately after it, I saw it and people are texting me,” Vikings Vice President of Content and Production Bryan Harper said. “Over the course of the next day, we got hundreds of emails from fans, ‘We’ve got to do this,’ and we’re the only team that can do it." The Vikings asked the Icelandic national team for permission to use the chant, which debuted at the Vikings' first home game at US Bank Stadium. After the Vikings got the thumbs up, they had Icelandic soccer team captain Aron Gunnarsson and Thor Bjornsson, who plays The Mountain on Game of Thrones, make a video introducing the chant to fans. Harper says the team doesn't want the chant to get stale, so it's used just once before the game and once during the game. (The pregame version ends with the sounding of the Gjallarhorn, as seen at the bottom of the page.) That plan doesn't account for impromptu moments like Keenum's celebration after the game-winning touchdown or the time Vikings fans chanted in Green Bay. It's even popped up at Minnesota Wild games and inspired players on the opposing team -- like Winnipeg captain Blake Wheeler, a Minnesota native -- to join in. The chant was adapted to include fans yelling "skol" because the team has long used the word as a part of its cheers, which includes singing the "Skol, Vikings" song after a touchdown. The word itself comes from Old Norse. Written today as "skål" in Danish, Norwegian, and Swedish, a skål was a communal bowl that was often full of beer. Because it was a ritual enjoyed with friends and community, it became a way of saying "cheers" or "good health."